Swiss artist Sipho Mabona will use the template for this origami elephant to create a life-size version. Origami has always been an artform that’s fun to watch. 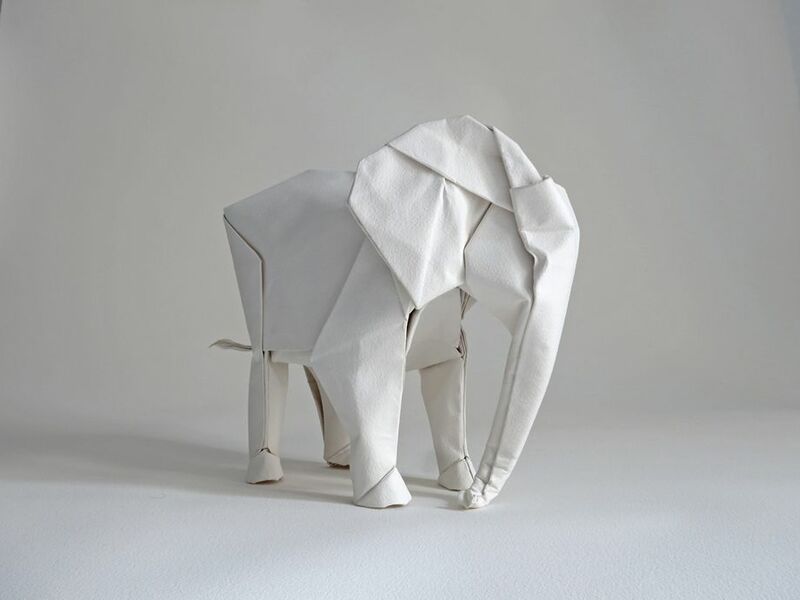 But now one Swiss artist is attempting to elevate the concept of origami as performance art with an Indiegogo campaign to help him realize his whimsical ambition to fold a life-size elephant from a single sheet of paper. The Lucerne-based Sipho Mabona folded his first paper airplane at age 5 and has since made a career producing stunning origami animals, roses, human figures, and insects, among other more abstract creations. He has shown his work and taught origami workshops around the world. Now the 33-year-old artist is appealing to Indiegogo’s crowdfunding angels to help him realize his ambition of folding a life-size elephant out of a single sheet of 50-by-50 foot paper. * (So far he’s raised $13,843 of his $24,000 goal with three weeks to go.) Mabona says his aim is to show what a single sheet of paper can do by using it to create a replica of one of the world’s most imposing land-dwelling creatures. A crease pattern used to fold the elephant took a month to work out. Mabona told me by phone that he developed the pattern for the elephant in about a month, a process that was sped up by having already worked out how to make patterns for origami tigers, bears, and rhinos. He said that his process is a combination of precise geometry and artistic intuition. To make a work of origami, he makes all the folds in the paper before refolding along the crease lines to assemble a finished 3-D object. The beauty of a piece of paper with intricate crease lines has also inspired him to produce crease patterns as wall art and ceramic plates. The crease pattern used to make the elephant is a work of art in its own right. Mabona expects the process will take about two weeks. The project will require three assistants and the elephant will be shored up by an aluminum frame and sealed with white acrylic paint. He plans to set up in a local art venue and provide a live online video stream of the process. If all goes well, he hopes to repeat the performance in other venues. Check out this video to learn more about the project and for a glimpse of the giant crease pattern that will be used to make the elephant. *Correction, Dec. 16, 2013: This post originally misstated the dimension of the paper being used to make the elephant. It is 50-by-50 feet, not meters. Kristin Hohenadel is a writer and editor whose work has appeared in the New York Times,Fast Company, Vogue, Elle Decor, Lonny, and Apartment Therapy. When you head out to your next party this holiday season give your hosts a gift they can appreciate over and over. The Origami Wine Tote from BUILT is a functional wine tote that features a unique design. This unique wine tote compresses flat for easy storage. Expand it for use and the wine tote turns into a beautiful carrying case for your bottle of wine. The tote holds a single 750ml-1 liter bottle of wine. Not only is this tote attractive and can be used to display your wine, it also protects your wine bottle from accidental bumps and drops. A carrying handle makes it easy to transport your bottle of wine so you don’t have to carry it awkwardly by the neck or the thick cylindrical body. The Origami wine tote comes in black or red. Each tote comes with a gift tag so you can gift a bottle of wine without the need of wrapping. Find the Origami wine tote at BuiltNY.com and at retailers nationwide. STAFF PHOTO BY ROB NOVIT McKintley Morgan, a Millbrook Elemetentary School fourth-grader, completes her origami frog. She and her classmates will show other kids how to make the paper frogs at the upcoming Science Education Enrichment Day (S.E.E.D. ), scheduled at USC Aiken on Saturday, Oct. 12. More than two dozen frogs were hopping all over Karey Santos’ fourth-grade classroom at Millbrook Elementary School last week. OK, the frogs are made of paper – origami frogs, actually, that the students will bring to the Science Education Enrichment Day (S.E.E.D.) at USC Aiken on Saturday, Oct. 12. STAFF PHOTO BY ROB NOVIT An origami frog takes flight as Millbrook Elementary School fourth-graders Cameron Eubanks and Torean Williams test its hopping ability. Karey Santos and her students will host an exhibit at the Science Education Enrichment Day (S.E.E.D.) at USC Aiken on October 12. That event will attract more than 3,000 people from 10 a.m. to 3 p.m. Nearly 70 exhibitors – ranging from Savannah River Site staffers, businesses and other organizations — will provide an array of interactive activities. Santos in the past has brought nine-year-olds to serve as exhibitors and is delighted to do so again. Converting sheets of paper into hopping frogs demands some intricate folding, yet the process is even more involved. The children created large frogs and much smaller “peepers,” pressing down a flap on each frog to send it flying more or less through the air. McKintley Morgan and the majority of her classmates thought the smaller frogs would go farther, and they were right. “The smaller frogs are lighter, and the weight made a big difference,” McKintley said. The kids had other assignments with the project — measuring distances to one-eighth of an inch, plotting the results and determining the mode, mean and median, getting experience with geometry and vocabulary, Santos said. Her students will get a chance to see all the other exhibits. In two-hour shifts, they also will show other kids how to create an origami frog and test how far it can leap. In addition, they will introduce leaf-rubbing and demonstrate how pantometers are used for measuring angles. Senior writer Rob Novit is the Aiken Standard’s education reporter and has been with the newspaper since September 2001. Atlanta – A Georgia Tech-led research team has been awarded a $2 million grant from the National Science Foundation (NSF) to develop a unique approach to making extremely compact and highly efficient antennas and electronics. The new technology will use principles derived from origami paper-folding techniques to create complex structures that can reconfigure themselves by unfolding, moving and even twisting in response to incoming electromagnetic signals. These novel structures could be fabricated from a wide variety of materials, including paper, plastics and ceramics. Sophisticated inkjet printing techniques would deposit conductive materials such as copper or silver onto the antenna elements to provide signal receiving and other capabilities. Several potential activation mechanisms would allow the origami-shaped antennas to rapidly unfold in response to various incoming signals. These mechanisms include the harvesting of ambient electromagnetic energy in the air, as well as the use of chemicals that produce movement in ways that mimic nature. The result would be powerful, ultra-broadband capabilities in a diminutive antenna measuring only a couple of centimeters when folded. Commercial and military applications for such antennas could include many types of communications equipment, as well as wireless sensors, “smart skin” sensors for structural health monitoring, portable medical equipment, electronics mounted on vehicles or flying/space platforms, agricultural sensors, and cognitive electronics that adjust to ambient conditions in real time. Origami is a traditional paper-folding art that is prominent in Japan and also practiced elsewhere, and includes both modular and moving types of structures. In recent years, mathematicians worldwide have focused on theoretical and practical questions raised by origami. Technical advances – such as novel ways of folding vehicle airbags – have resulted. The Tentzeris team is working with mathematicians at Georgia Tech and elsewhere to develop formulations that will allow optimal exploitation of origami-related principles. One important goal, Tentzeris said, is to maximize the number of shapes that can be achieved in a single folding structure. That, in turn, will support antenna functionality. The four-year project will involve Tentzeris and a team of six graduate students, along with some undergraduate students. Other project leaders include John Etnyre, a professor in the Georgia Tech School of Mathematics, and Stavros Georgakopoulos, an assistant professor in the Florida International University Department of Electrical and Computer Engineering. Etnyre will focus on the mathematics of origami-shaped devices. Georgakopoulos will perform a significant set of tasks focused on resonators and related prototypes, while actively participating in the modeling procedure. Various international origamists will participate in this effort by introducing novel origami shapes and folding algorithms. One element essential to the project is the concept of self-actuation – antennas unfolding by themselves. In some cases, Tentzeris said, unfolding would happen automatically when a specific incoming frequency triggered a chemical activation mechanism. This kind of mechanism is related to the ability of plants, like daylilies, to unfold in response to a stimulus such as light. In other cases, energy harvested from ambient electromagnetic energy in the air could provide power for activation, said Benjamin Cook, a graduate student working with Tentzeris on the project. Antenna deployment could be powered by built-in circuits that collect energy from such ambient airborne signals as TV and radio signals – a technique already demonstrated successfully by a Tentzeris research team. When required, antenna movement could be powered by activation beams from a special-purpose energy harvester. This device would collect ambient energy and transmit it to antennas from as far away as 50 to 100 meters. Novel wireless power transfer architectures, currently being investigated in another joint NSF project of Tentzeris and Georgakopoulos, could further enhance the range of beam-power transfer. Inkjet printing will also be essential to the development of origami antennas, Tentzeris said. Special inkjet techniques developed in recent years by Tentzeris and his team can deposit tiny antenna circuitry and supporting electronics, dielectrics and nanostructures onto a broad variety of materials. Such materials could consist of paper, polymers, fabrics, carbon fibers, ceramics and flexible organics, depending on the application. When necessary, the origami-shaped antennas could be ruggedized using robust materials. Metallic inks – formulated with a wide variety of conductive materials such as copper, silver, gold, nickel and cobalt – would be used. The choice of material would depend on the specific functionality required. This research was supported by the National Science Foundation (NSF) under award EFRI-1332348. Any opinions or conclusions are those of the authors and do not necessarily reflect the official views of the NSF. I’ve been spotting geometric origami projects left and right and there’s no better place to use them than in a modern wedding reception. Try a bunch of them as centerpieces for a a table, or hanging overhead as lanterns. Or create a pattern out of paper and adhere them to a wall. There are so many ways to use them and they add a clean, fresh vibe to the event. Geometric origami inspiration | Brooklyn Bride – Modern Wedding Blog. The quintessential piece of origami might be a decorative paper crane, but in the hands of an interdisciplinary Penn research team, it could lead to a drug-delivery device, an emergency shelter, or even a space station. The Penn team is led by Randall Kamien, a professor in the Department of Physics and Astronomy in the School of Arts & Sciences, and includes Shu Yang, associate professor in the School of Engineering and Applied Science’s departments of Materials Science and Engineering, and Chemical and Biomolecular Engineering. Collaborating with researchers at Cornell University, the Penn team will share in a $2 million, four-year grant from the National Science Foundation’s Division of Emerging Frontiers in Research and Innovation. The grant is through a program called ODISSEI, or Origami Design For The Integration Of Self-assembling Systems For Engineering Innovation. 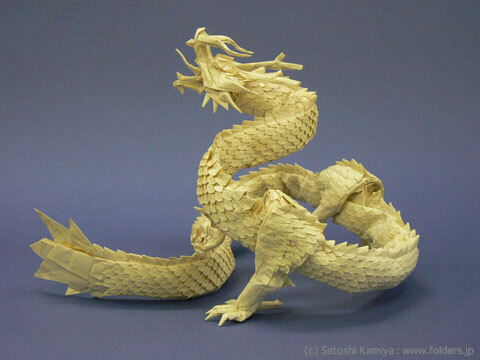 The program draws inspiration from the Japanese art of paper folding, but the Penn team suggested adding a variant of the technique, known as kirigami, in which the paper can be cut as well as folded. Allowing for cuts and holes in the material makes it easier to fold rigid, three-dimensional structures. The Penn team plans to begin by prototyping designs with paper and 3D-printed plastic. “We want to demonstrate the concept in the macroscale, but once we have a grasp on how the theory and experiment work together—where to introduce cuts and folds—we’ll shrink it down to the microscale,” Yang says. Finished kirigami configurations in front of the template. Kirigami is a variant of origami that allows cuts as well as folds. Yang and Kamien have collaborated on similar molecule-manipulating research in the past. Along with Kathleen Stebe, deputy dean for research at Penn Engineering, they developed a technique for getting a layer of liquid crystals to form different patterns of divots or bumps based on nanoscale templates. These concepts can also be scaled up, enabling applications such as emergency shelters that can be folded flat for transport. Kirigami architecture is particularly attractive for space-based structures, which are free from the size constraints imposed by gravity, but still need to fit into the cargo bays of launch vehicles. Penn researchers integrate origami and engineering | Penn Current. If you think of frogs or birds when someone mentions origami, then perhaps you need to visit the new exhibit, “Folding Paper: the Infinite Possibilities of Origami,” at the Crocker Art Museum, where you’ll see some frogs and some birds, but you’ll also see pieces created by artists from around the globe that go far beyond what’s taught in elementary school. How about a dress that can be worn standing up, and a matching pair of shoes? Each item was created from a single sheet of parchment paper, without making any cuts. If a parchment dress isn’t to your liking, perhaps a red dress created from a more traditional dress fabric will suit you for that special evening out. What do dresses have to do with origami? Well, as this exhibit shows, the art of folding paper touches many aspects of daily life, including clothing, buildings, maps and even phone designs. You won’t want to rush through this exhibit because the lighting is as important as each piece. Watch how the shadows play on Bernie Peyton’s “Frog on a Leaf,” which reminded me of a haiku. Move in close, to the left, to the right, then step back and see how the light shifts, allowing some parts to come forward and others to recede. One of the most important pieces in the exhibit is Miri Golan’s “Two Books,” which have tiny people figures emerging from the Koran and the Torah. The tiny figures, which appear to be worshipping, come together in peace. Spheres created by artists from Poland, Japan and Germany incorporated metallic paper, ticker tape, paper tape and even copy paper, while Robert J. Lang used glassine paper for his piece, “3 7 Hyperbole Limit, Opus 600,” one of few relatively flat pieces in the exhibit. The tiniest piece in the exhibit is a crane folded from a candy wrapper. Be sure to take time to read about Sadako Sasaki and how she came to fold this crane, if you do not already know her story. What should you not miss? The film showing speed folding; Lang’s giclee prints of the crease patterns he used in creating “Bull Moose,” “Scorpion,” and “Red-Tailed Hawk”; the story of the impact of origami on science and industry; and the history of origami, including information about Akira Yoshizawa, who became known as Japan’s first origami fine artist. This exhibit, curated by Meher McArthur, opened Sunday, June 30, and runs through September 29. To complement the exhibit, the Crocker Art Museum is offering several special events for adults and children. Please visit the museum’s website for more information. Sacramento Press / Rethinking origami as ‘Folding Paper’. Visit my booth at the Mini Makers Faire next weekend at Seattle Center! Artigami: Flights of Fantasy at the Seattle Mini Maker’s fair June 8&9! MAINEVILLE, OH (FOX19) – Students at Little Miami elementary and primary schools learned the ancient art of origami recently when children’s author Christine Petrell Kallevig brought “Storigami” to their buildings. Kallevig’s visit was sponsored by the PTOs of each building. Author tells stories with origami | Schools | Warren County News.